In the early 1840s, T. & R. Willats was one of the leading scientific instrument makers in London, specializing in barometers, thermometers, and telescopes. It was also one of only two companies supplying photographic chemistry and equipment to the amateur practitioners of the day. Opticians (and brothers?) Thomas and Richard Willats had shops at 98 Cheapside (1840s-50), 28 Ironmonger Lane (1851-56), and 2 Church Lane, Homerton (1857-60). Sir John Herschel; Horne, Thornewaite, & Wood; John Johnston; Negretti & Zambra; Nicholson; T. S. Redman; J. Sherrington; G. Wharton Simpson; Thomas Sutton; William Harding Warner; Richard Willats; and Walter Bentley Woodbury. 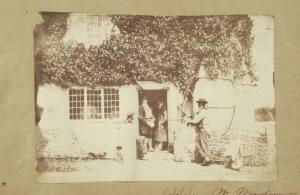 Many of these men were leading practitioners of early paper photography. Robert Bingham was the author of his own manuals including Photogenic Manipulation. 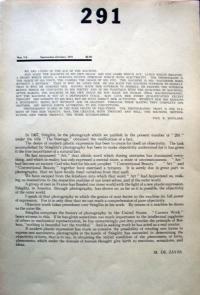 Part I: Containing the Theory and Plain Instructions in the Art of Photography, or the Production of Pictures through the Agency of Light…. 4th ed. (London: George Knight and Sons, ) and The Collodion Process: being a supplement to Part I of Photogenic Manipulation (London: G. Knight and Sons, ). 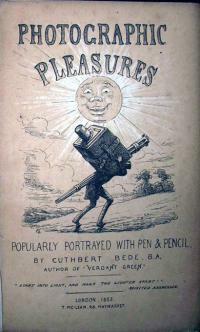 Joseph Cundall was a leading book binder and publisher, known for his handsome illustrated children’s books. 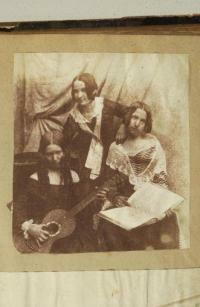 He also experimented with early paper photography. 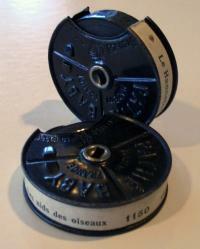 Opticians Henry Negretti and Joseph Warren Zambra formed a scientific instrument company, Negretti & Zambra, in 1850. 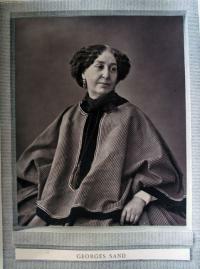 They also printed and published photographs using various early processes. 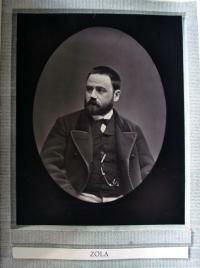 Continue reading Richard Willats' Collection of Paper Photography. At the age of twenty-two, John Foster had completed his education at Harvard and was teaching English grammar in Dorchester, Massachusetts. When his friend and minister, the influential Richard Mather, passed away, members of the congregation planned a publication in his honor. 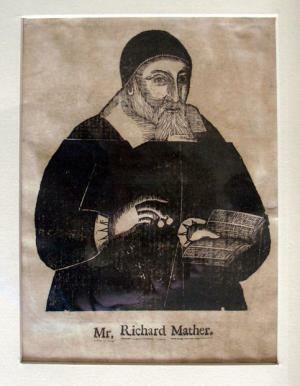 Foster offered to design and print a woodcut portrait of Mather for a frontispiece to The Life and Death of That Reverend Man of God, Mr. Richard Mather. Only six copies of the print are known. 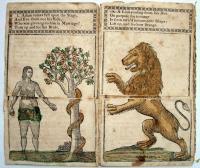 It is considered the first woodcut printed in the United States. 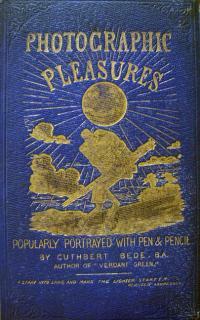 Graphic Arts holds three different editions of this ealy American juvenile. 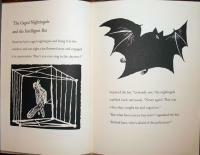 This one contains eight woodcuts by James Poupard. The prints are arranged into sections with four of the plates cut through the center so that the top and bottom can be raised. 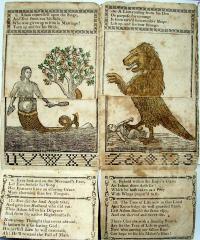 The lion turns into a griffin, the girl into a mermaid, etc. According to Sinclair Hamilton’s Early American Book Illustrators and Wood Engravers, some later 19th-century editions carry the title Metamorphosis; or, a Transformation of Pictures with Poetical Explanations for the Amusement of Young Persons. 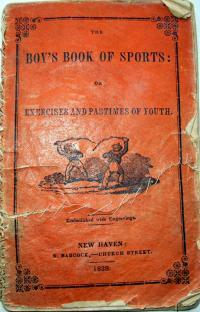 The Boy’s Book of Sports: or, Exercises and Pastimes of Youth. New Haven: S. Babcock, 1838. Wood engraving by Alexander Anderson (1775-1870). Graphic Arts Collection. Gift of Sinclair Hamilton, Class of 1906. In the 1820s, a group of men from Philadelphia, prevented by an obscure ordinance from enjoying their favorite pastime in their own city, began playing an early version of baseball in Camden, New Jersey. By the 1830s, other teams had formed along the East Coast, and rules to the game were published in Robin Carver’s Book of Sports (1834). 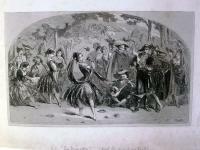 Carver’s book included this wood engraving depicting a baseball game played on Boston Common. The same block was used to illustrate several publications over the next few years, including the first and second editions of The Boy’s Book of Sports (1835 and 1838). The Potawatomie Indian Tribe occupied various lands in Illinois, Indiana, Michigan, and Wisconsin as they were pushed further and further west by U.S. government treaties. As hunters and farmers, one of the many things they were known for was their medicinal herb gardens. 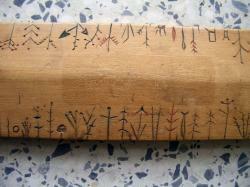 This is a nineteenth-century Potawatamie herbarium, or medicine stick, identifying the plant specimens from one area or territory. Note the hand-coloring. 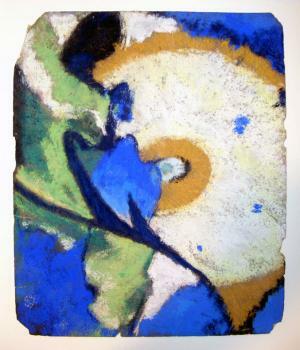 This untitled and undated pastel by the American modernist Arthur Dove found its way into the graphic arts collection without even a mention in the department's annual "new and notable" commentary. It has never been published and was not included in the artist's catalogue raisonné. The pastel has been attributed on the verso to the 1930s, which is fitting. In 1920s, Dove lived with Helen Torr in a houseboat on Huntington Harbor, off Long Island, and he often included abstracted landscapes of the water and shore in his work. Dove also included elements of collage in his work of this period, none of which are present in this pastel. At the end of the 1920s, Dove wrote to his dealer Alfred Stieglitz, "Am more interested now than ever in doing things than doing something about things. The pure paintings seem to stand out from those related too closely to what the eye sees there. To choose between here and there--I should say here." Dove to Stieglitz, October 1929, Beinecke Library. In 1933, Dove moved to rural Geneva, New York, and produced a number of formal color studies based on the wildlife of the area, emphasizing shapes and lines in an effort to move closer to an organic abstraction. When he returned to Long Island in 1938, Dove's work changed once again; his color pallet became bolder and his abstractions more geometric. It is from somewhere within the early 1930s period that I believe Princeton's pastel was created. 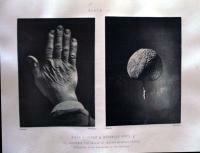 Nasmyth photographed his own hand to demonstrate the similarity between the shrinking of the molten surface of the moon and the wrinkling of his own skin. Professor Grafton had more to say on the transformation of reading, writing, and information-storage in the digital age and happily, his words caught the attention of the guys at Crumpled Press. 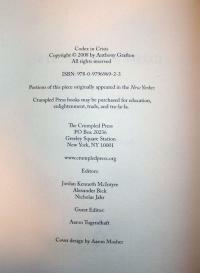 Together they have published an expanded version of the essay, now entitled Codex in Crisis. 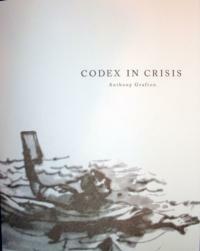 Codex in Crisis was published in limited edition of 250 copies and graphic arts is fortunate to have purchased one on the night of its unveiling. Whether copies are still available is doubtful. Professor Grafton is the author of ten books and the coauthor, editor, coeditor, or translator of nine others. Two collections of essays, Defenders of the Text (1991) and Bring Out Your Dead (2001), cover most of the topics and themes that appeal to him. His current project is a large-scale study of the science of chronology in 16th- and 17th-century Europe: how scholars attempted to assign dates to past events, reconstruct ancient calendars, and reconcile the Bible with competing accounts of the past. In 1954, Princeton received a gift from the painter Georgia O'Keeffe (1887-1986). This donation included issues of 291, a monthly magazine published out of The Little Galleries of the Photo Succession, run by her husband Alfred Stieglitz. Today, the graphic arts division holds issues no. 2-7/8 (although no.1, 9-12 are currently missing, things have a way of turning up). 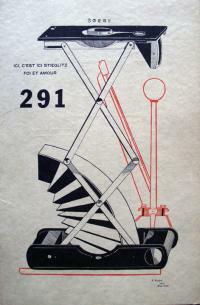 291 was edited by Alfred Stieglitz (1864-1946), Marius de Zayas (1880-1961), Paul Haviland (1880-1950), Agnes Ernst Meyer (1887-1970), and to a lesser extent Francis Picabia (1879-1953), and Katherine N. Rhoades (1885-1986). Many of the prints include hand-coloring and issue no. 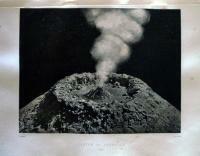 7/8 has a photogravure by Stieglitz. 291 no.3 May 1915. 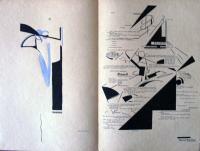 Page design by Marius De Zayas, poems by Katherine N. Rhoades and Agnes Ernst Meyer. 291 no.3 May 1915. 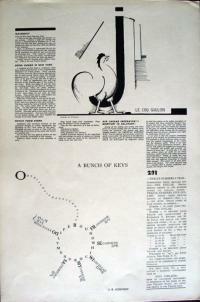 Le Coq Gaulois drawn by Edward Steichen. "A Bunch of Keys" by J.B. Kerfoot. The inspiration for 291 came in 1914, when De Zayas was in Paris searching for art to exhibit in the New York gallery. In one of his letters back to Stieglitz, he mentions the visual poetry of Guillaume Apollinaire (1880-1918) "[who] is doing in poetry what Picasso is doing in painting. He uses actual forms made up with letters. All these show a tendency towards the fusion of the so-called arts." When De Zayas returned, he convinced Stieglitz of the need for a new magazine devoted to visual poetry and satire. Together with Haviland and Meyer they began 291. 291 no.4 June 1915. "Fille née sans mêre" drawn by Picabia, poem by Rhoades. 192 no.4 June 1915. "291" drawn by John Marin. Only about 100 copies of the regular and deluxe (heavy paper) editions were sold to subscribers. The magazine never found an audience in New York and the publication only survived for one year before closing. Stieglitz sold the entire back stock to a ragpicker for $5.80. 291 no.5/6 July/August 1915. 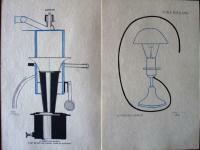 "Canter" and "Voila Haviland" drawn by Picabia. 291 no.5/6 July/August 1915. 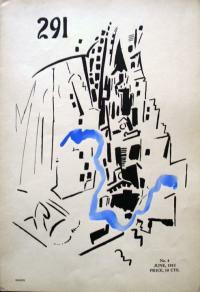 "Ici, c'est ici Stieglitz foi et amour" by Picabia. 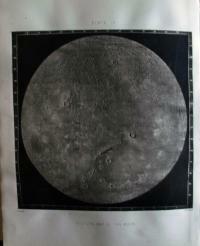 291 no.7/8 September/October 1915. 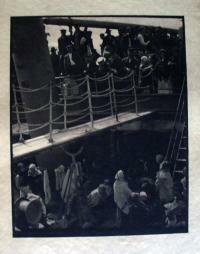 "The Steerage" by Stieglitz. Comments on "The Steerage" by Paul B. Haviland and De Zayas. Newly acquired by the graphic arts division is this unique twenty-volume extra-illustrated copy of Life and Labours of Hablôt Knight Browne. 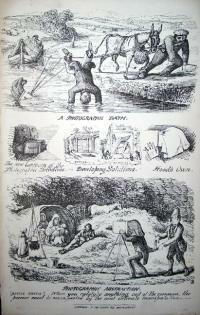 Browne was the 19th-century illustrator best known for his steel-plate etchings and wood engravings for ten books by Charles Dickens. As it was originally published in 1884, Thomson’s single volume biography contained an engraved portrait and 130 illustrations (GA Rowlandson 946). 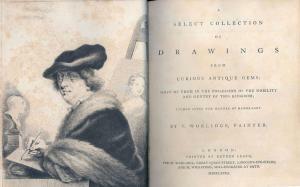 Princeton’s unique copy has been vastly expanded to 20 volumes, extra-illustrated with the insertion of more than 1250 plates, including 11 watercolours, 81 pencil and ink drawings (a few with a touch of colour or double-sided), and 11 autograph manuscript items signed by Browne. Among the manuscripts are a group of charming illustrated letters to Frederick William Cosens, an avid collector of Dickens. Cosens commissioned Browne to furnish him with watercolor drawings of every image he had created for a Dickens novels (more than 400 in all). 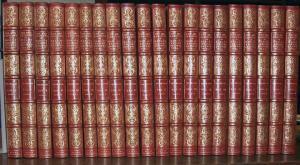 It has been speculated that this 20 volume set is the work or commission of Cosens, although the provenance is not certain. These volumes present to researchers not only a wonderful collection of art by one of the great illustrators of the 19th century, but also a number of variant states of the final plates. 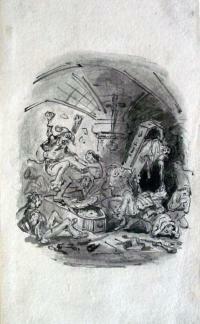 The sketches and letters provide documentary information about Browne that cannot be obtained elsewhere. William Morris (1834-1896) wrote, “Have nothing in your houses which you do not know to be useful or believe to be beautiful.” [Hopes and Fears for Art, Rare Books (EX) 3867.4.345] One of the objects Morris would not have objected to was his own Works of Geoffrey Chaucer, also known as the Kelmscott Chaucer after the press where it was printed. 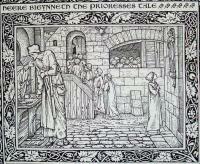 In 1891, Morris set up three presses in his home, where he could design and print fine press editions. Over 50 books were completed. 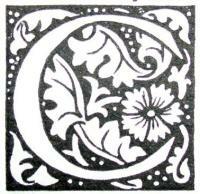 The Kelmscott Chaucer was one of the last and certainly one of the most successful. 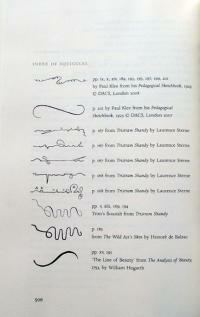 The book was the product of many talented men besides Morris. The text was edited by Frederick Startridge Ellis (1830-1901), ornamented with 87 pictures designed by Edward Burne-Jones (1833-1898), and engraved on wood by William Harcourt Hooper (1834-1912). It is interesting to noted that Burne-Jones’s drawings were photographed and the photographic images printed onto the woodblocks to ensure the fidelity of the engraving. 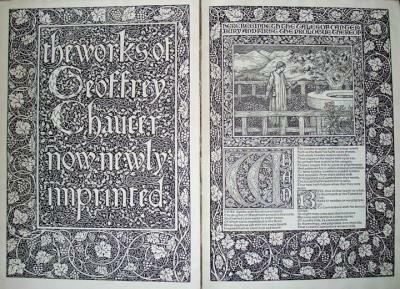 The full-page woodcut title, fourteen large borders, eighteen borders or frames for the pictures, and twenty-six large initial words, along with the ornamental initial letters large and small were designed by Morris. 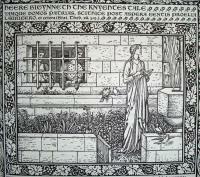 For more on this, see The Life of William Morris by J. W. Mackail, v. 2, p. 326, Graphic Arts collection (GAX) PR5083.M25. 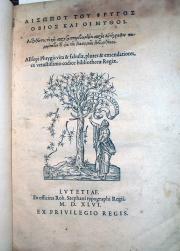 425 copies of the book were completed by a total of 11 master printers. Thanks to Morris’s expert salesmanship and personal magnetism, the entire edition was sold out before the books were finished on May 8 and issued on June 26, 1896. Galerie contemporaine, littéraire, artistique was published weekly in its first series from 1876 to 1880, and in a less regular second series from 1881 to 1884 (not in the Princeton library). The general public were persuaded to subscribe, and did in large numbers, by the captivating woodburytype portraits contained in each issue. These portraits were of contemporary celebrities from literature, music, science, politics, or the arts; each photographed by some of the great photographers of the day. 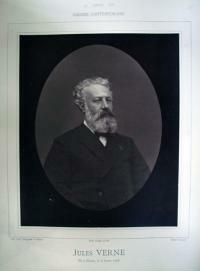 Shown here are portraits of Jules Verne (1828-1905) and Émile Zola (1840-1902) made by Étienne Carjat (1828-1906); and George Sand (1804-1876) made by Nadar (pseudonym of Gaspard-Félix Tournachon 1820-1910). The woodburytype (called photoglyptie in France) is not considered a true photograph because the image is not created from light-sensitive material. 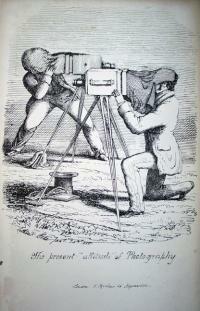 Instead we call it a photomechanical print. To make a woodburytype, a tough gelatin relief is created from a glass negative, which is then pressed into a sheet of soft lead creating a mold of the image—thick and thin as the image is dark and light. The mold is filled with a pigmented gelatin (usually purplish-brown) and covered with a piece of paper. When run through a printing press the gelatin is transferred onto the paper making an extremely detailed image but one that will not fade because no light-sensitive chemistry was involved. 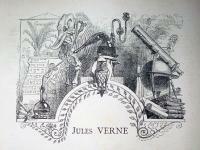 Such permanent prints were especially useful for commercial periodicals, such as Galerie contemporaine. By the early 1920s, the Société Pathé Frères had built the largest film equipment and production company in the world. 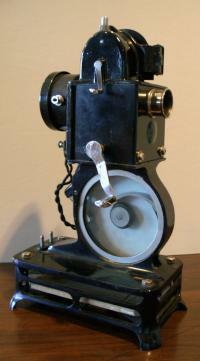 To increase their 1922 Christmas sales, they released the first projector meant for home use: the Pathé Baby. Kodak quickly released its own brand of home equipment and film, which found greater popularity and by 1935 Pathé was forced into bankruptcy. The 9.5 mm Pathé Baby films come in small cassettes holding approximately 30 feet of film that plays for around 60 seconds. What makes it unique is that it has sprocket holes down the center rather than on the sides. The film also has an ingenious little notch cut into each title frame that triggers the projector to stop for a few seconds, even though the operator continues to crank the film, allowing viewers time to read the text. 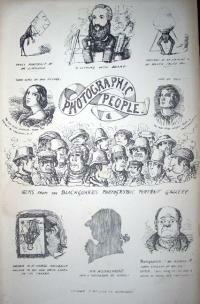 Princeton's collection of optical devices, and optical prints and photographs, is basically a pre-cinema collection. However, thanks to the help of Professor Rubén Gallo, we recently acquired a 1920s Pathé Baby projector along with approximately 1,000 Pathé films, including natural history, animation, biography, current events, and multi-reel comedies and dramas. Tree and Serpent Worship was compiled by the self-taught historian James Fergusson (1808-1886), who made his fortune at a young age in Calcutta and then devoted the rest of his life to his passion for Indian architecture. 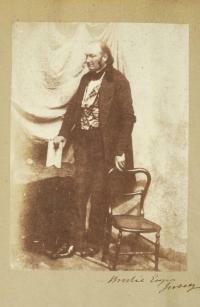 Fergusson befriended a number of the British officers who spent their time in India practicing the new art of wet-plate photography, such as Major Robert Gill (1804-1879) whose albumen prints were used to illustrate Fergusson’s 1864 edition of The Rock-Cut Temples of India (Graphic Arts Collection (GAX), 2007-2590N). 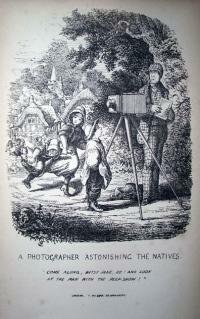 Another of Fergusson’s associates was James S. Waterhouse (1842-1922), who never used a camera before arriving in Calcutta. He became so accomplished that he was ultimately named surveyor-general to the monumental Survey of India. Under the sponsorship of the Indian government, Waterhouse spent eleven years—from 1864 to 1875—documenting the ethnic diversity of the people of India; work later replicated by Edward Curtis and others who joined the international mania for mammoth ethnographic studies. 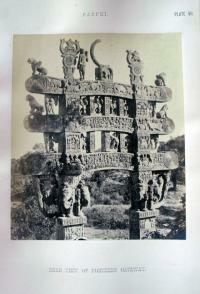 During that same period, Waterhouse provided Fergusson with a group of images depicting the ancient Buddhist monuments in Sanchi, a small village in the state of Madhya Pradesh. 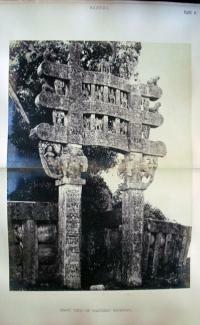 The frontispiece of Tree and Serpent Worship shows Waterhouse’s image of the Northern gateway to the Great Stupa at Sanchi. This is the oldest of the religious stupas, or mounds, constructed in the third century BCE to hold the remains of the Buddha. Along with 20 photographs by Waterhouse are 36 by W. H. Griggs (1832-1911), depicting Amravati sculptural fragments from the collection we now know as the Victoria & Albert Museum. Around 1740, painter and printermaker Thomas Worlidge settled in the Covent Garden section of London. He found success painting portrait miniatures and later, as an etcher working “after the manner of Rembrandt”. This refers to his drypoint technique of drawing with a sharp needle directly into the surface of the copper plate. It also alludes to Worlidge’s admiration for Rembrandt the man, such as in this frontispiece self-portrait, which is a clear imitation of a Rembrandt self-portrait. The series was published in parts, some of which seem to have been issued as early as 1754 but Worlidge died before the work was completed. It was finished by his pupils William Grimaldi and George Powle, and was published by his widow in 1768 at the price of eighteen guineas a copy. 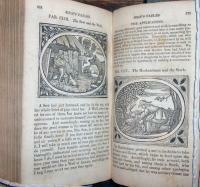 In its original shape the volume bore the title, A select Collection of Drawings from curious antique Gems … printed by Dryden Leach for M. Worlidge … and M. Wicksteed, Seal-engraver at Bath. The frontispiece, dated in 1764, shows Worlidge drawing the Pomfret bust of Cicero; behind on an easel is a portrait of his second wife, Mary. No letterpress was included originally in the volume, but between 1768 and 1780 a few copies were issued with letterpress. After 1780 a new edition in quarto, deceptively bearing the original date of 1768, appeared with letterpress in two volumes at five guineas each. 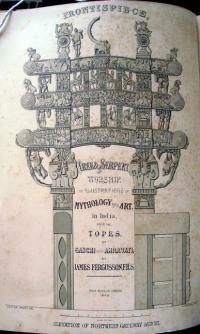 The title-page omits mention of M. Wicksteed’s name, but is otherwise a replica of the first.